When I returned from my son’s wedding in May, after having my new daughter-in-law show me how to make spring rolls, I was totally enthralled with them. I made spring rolls every day for about two weeks with a variety of fillings, and I went on a quest for interesting dipping sauces to go with them. Yes, I went a little crazy. You know me. Well, I had a lot of dipping sauces in my fridge and was in need of someone to feed them to, so I took my dog and pony show to my friend Michele’s house. 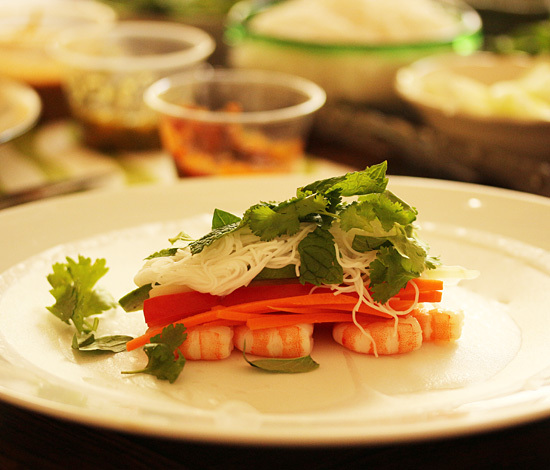 We started out with Happy Pancakes and then a bowl of Tamerind Soup with rice noodles, shrimp, mushrooms and tofu. I’ll be posting this recipe in the near future. 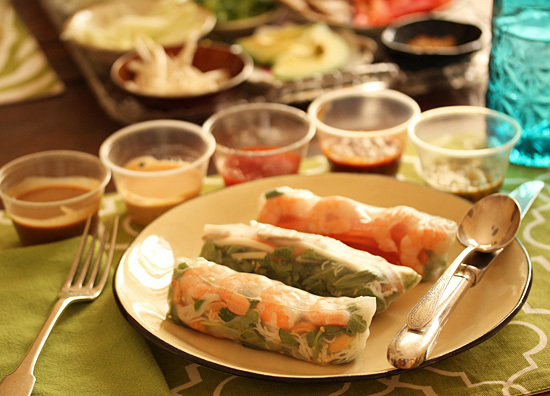 Next I set up all my ingredients to stuff the spring rolls on a tray in little bowls. 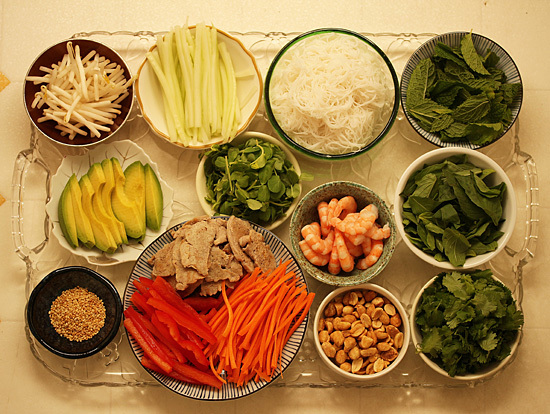 Bean sprouts, cucumber, rice noodles, mint, avocado, pea shoots, shrimp, Thai basil, toasted sesame seed, red pepper, sliced pork loin, carrots, peanuts and cilantro. We were ready to rock and roll! Here is Michele’s dining room table. You can see the dipping sauces in the little plastic cups. There are five, because one was used with the Happy Pancakes and one was used in the Tamerind soup we’d eaten. I was still deciding which one was going to be the eighth sauce. I showed Michele how to wet the wrappers and stack the goodies inside. I didn’t have a bowl of water on the table; I just ran water from the kitchen tap over the rice paper before putting it on the plate. A really smooth plate so the wrapper wouldn’t stick. The wrapper is rolled away from you, with the closest side covering the goodies, then the sides are folded over and the whole packet rolled up to seal. I put different goodies in each roll to see how they would taste. All were good. Very Good. The tamarind soup mix was the only ingredient I really had to hunt for and finally found at the 99 Ranch Market on an endcap across from the fresh fish tanks. They had these three brands and I didn’t know which would be better, so I bought one of each. They were very inexpensive. I made 10 cups of each and then sampled them to my own taste. The Vietnamese one on the left was too sweet for me. The Knorr from the Philippines was too salty and not sour enough. The one on the right from Thailand was perfect. Nicely sour and not too sweet or salty, this was the one I used in my recipe. Ps. 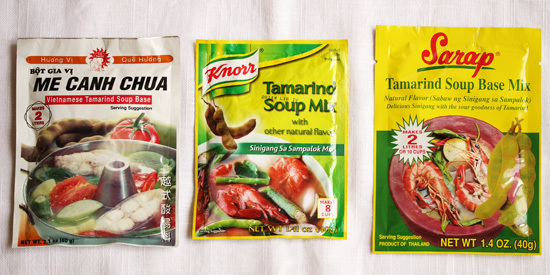 A couple of weeks ago I saw the Knorr tamarind soup mix at my local Ralphs market. It could be used in a pinch. Or get the Sarap on Amazon. 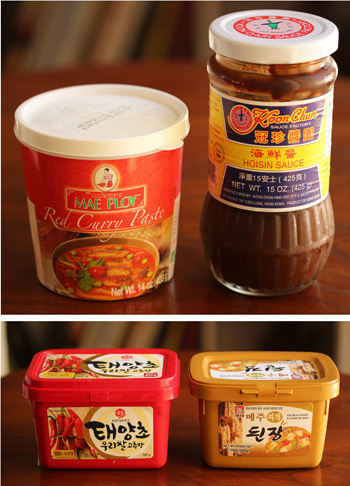 I prefer the Mae Ploy brand of curry pastes that are made in Thailand. I got the Koon Chun hoisin sauce at the 99 Ranch Market or you can order them on Amazon here and here. I got the gochujang and dwenjang at my local Korean Market or you can also order them on Amazon here. 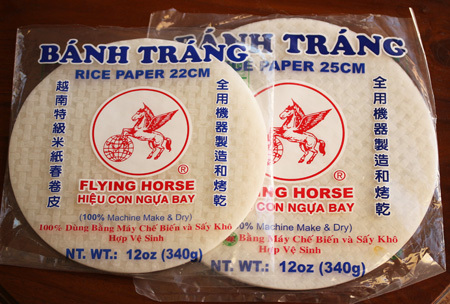 When you buy the rice papers, be sure to check the expiration date. They do get stale. I recommend you use the smaller 22cm size (8 1/2 inch), because filling and eating the large ones is unwieldy. 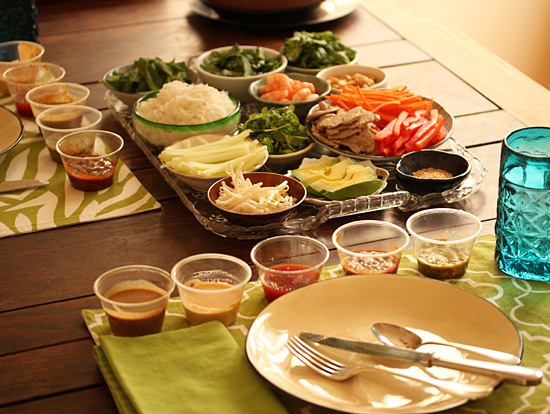 All of the dipping sauces ingredients can be found at your local market, except for the tamarind soup mix, hoisin, red curry paste, dwenjang and gochujang. Ps. I also saw dwenjang, gochujang and rice papers at my local Ralphs market for the first time. Korean cuisine seems to be one of the new phenoms. I had a lot of dipping sauce populating my fridge after this experiment, so I created new dishes to use it up. I will be posting about these creations in the near future, so stay tuned. 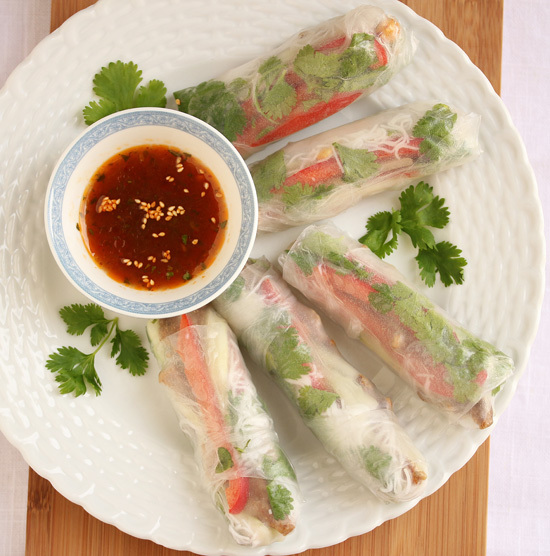 I hope these photos inspire you to try your own spring rolls and you probably have the ingredients for one or two of the dipping sauces in your pantry already, just waiting. 1. Heat oil in a 3-quart saucepan over medium heat. Add the curry paste and cook, stirring, until fragrant, about 30 seconds. 2. Add the peanut butter and sugar, and cook, stirring, 1 to 2 minutes, until sugar is melted. 3. Add coconut milk, broth, lime juice, hoisin and fish sauce, whisking until smooth. Bring to a simmer and cook, stirring occasionally, until thickened and reduced to about 1½ cups, about 45 minutes. Add basil, if using, and cool to room temperature. Can be made 3 days ahead and refrigerate in airtight container. Serve at room temperature. 1. Mix sauce ingredients together in a bowl. Can be made 3 days ahead and refrigerate in airtight container. Serve at room temperature. 1. Measure 10 cups water into 3-quart sauce pan and whisk in soup mix. Bring to a boil, stirring frequently, until powder is dissolved. You will still see particles. Set aside. Freeze leftover soup in 1 ¼ cup amounts for future dipping sauce or eating as soup. 2. Heat oil in a second 3-quart saucepan over medium heat. Add curry paste and cook, stirring, until fragrant and a shade darker, about 2 minutes. 3. Add water, 1 ¼ cups tamarind soup, honey, fish sauce and sriracha. Bring to simmer and cook until slightly reduced, about 5 minutes. 4. Mix cornstarch and water together. Whisk into sauce and cook until thickened, about 2 minutes. Stir in green onion and cilantro. Add additional honey to taste. Cool to room temperature. Can be made 3 days ahead and refrigerate in airtight container. Serve at room temperature. Freeze any leftover sauce in ice cube trays with 2 tablespoons per cube. This can be used as dipping sauce or to make tamerind soup. 1. Whisk together sauce ingredients in a bowl. Can be made 3 days ahead and refrigerate in airtight container. Serve at room temperature. 1. In a mortar, pound chiles, garlic and sugar to a paste. Stir in the fish sauce, lime juice and water. Can be made 3 days ahead and refrigerate in airtight container. Serve at room temperature. These look SO tasty! I love all the combos. 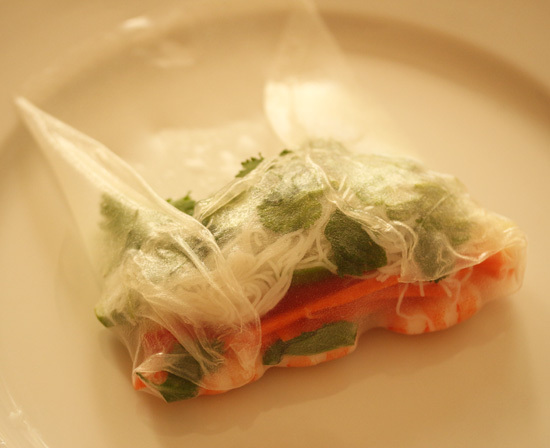 I’m a big fan of spring rolls but cannot find proper ones around here. Yum! I learned the hard way to use a smooth plate when I first started making spring rolls. They’re the perfect snack for one. Wow, someone really did their homework! 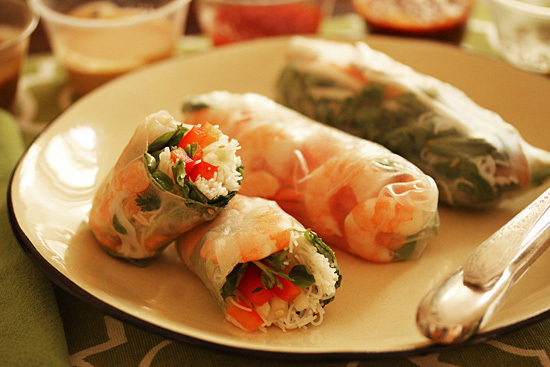 You deserve to take some time off for spring roll break. I so appreciate when test all the brands. I get lost in 99 Ranch so thanks for giving me some direction on what to buy while I am there. Your work on these beautiful rolls is appreciated.